When Milena Hoegsberg, acting chief curator at the Henie Onstad Kunstsenter just outside Oslo, read the book Words Without Pictures (LACMA 2009 / Aperture 2010) she began to ask many questions about a subject that, in her own words, is not her area of expertise. The book, edited by Alex Klein, was conceived in collaboration with curator Charlotte Cotton to create a thoughtful discourse around current issues in photography. Every month for a year, an artist, educator, critic, art historian, or curator was invited to contribute a short, unillustrated, opinionated essay about an emerging or changing aspect of photography. These essays are accompanied by online responses by other photographers, curators and writers as well as transcriptions of live debates. Hoegsberg: Words Without Pictures offers a language to address not just photography itself, but the crisis it might be in. I think this also extends to the lack of a critical framework to determine its aesthetic value under the rubric of visual art. The book has no illustrations – a strategy that both offered a welcome space for inner visualisation and occasionally had me refreshing my mem­ory through Google searches on my phone. I was really struck by the intertextual approach, the way the included texts refer not just to each other, but also to a rich historical discourse on photography. I’m curious about what led up to this publication and to the choice of title. Klein: I’m glad you responded to the format of the book. That was a very specific and considered decision that was made between myself, Charlotte Cotton and our designer David Reinfurt. Despite its seeming simplicity, and the role of the online component of the project, the objectness of the book was incredibly important to us. We wanted to strip away a pre- conceived photographic language going into the project because we were dealing with so many different types of photography and wanted readers to draw their own conclusions. The temporal dimension was also key. There’s a running header with the date at the top of each page that always grounds you in time. This is because the project is, in its simplest sense, a document of one year of conversations about photography that happened in person, in public forums, online and through correspondence. It’s no coincidence that the design also resonated with the stripped-down aesthetic of information often associated with classic conceptualism. The project initially developed out of a website that Cotton was working on called Tip of the Tongue and a one- week symposium and series of events called Around Photo­ graphy that I’d co-organised at the Hammer Museum with the artist James Welling. 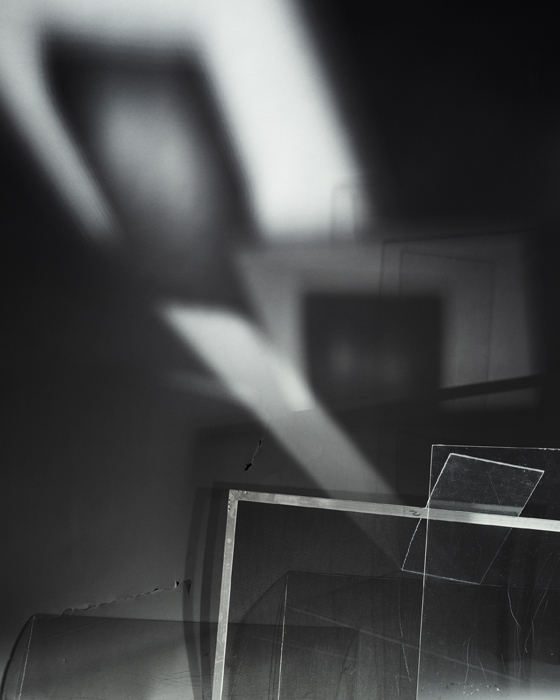 When we began the project in 2007 there was a feeling of urgency around the shifts in technology in both publishing and photography (believe it or not, it was still a moment when artists had a foot grounded equally in the analogue and the digital) and issues such as the resurgence of abstraction. Because we were based in Los Angeles and running the project out of the Los Angeles County Museum of Art (LACMA) it was deeply rooted in and pivoted around the conversations happening in the local community, which at the time were really exciting and contentious. My core concern, and I think one of my main contributions to Words Without Pictures, was to put different camps who don’t normally communicate in conversation with each other, such as art historians, photographers, ‘artists who use photography’, students, critics, enthusiasts, established artists, emerging artists, etc. I was keen to cross some wires and point to the multiplicity of what are seemingly simple prompts. Ultimately, we weren’t out to answer questions; it was more important to start the conversation and keep it open for continued discussion, which is why I think people still use the book in the classroom. Hoegsberg: I particularly like your comment that one of the book’s aims was to connect different people in the ‘photo world’ and get them all into the conversation. It seems to me that there’s still a gap between visual artists and people who define themselves as ‘photographers’. Especially now, in the age of image overflow, with sites like Instagram and a proliferation of good amateur photo­graphers making well­composed images – where everyone has a stake in ‘creativity’ – it seems important to insist on the rubric of ‘artist’ and be able to distinguish those who have a legitimate artistic project/practice from the rest. Klein: It certainly does, but I don’t get quite as worked up about it anymore. Part of the impetus to start the conversa- tions in Around Photography and Words Without Pictures stemmed from my own formative experience as an undergraduate working between the divide of the darkroom and the classroom. It was clear that the photographers privileged one history while the art historians, even when teaching a History of Photography course, were interested in another trajectory all together – it was very instructive for me to toggle between the two. That said, I think that gap is decreasing. It’s true that there is still a photo photo world, but I think there are more photographers working in the art world who navigate and draw from both histories. This has produced a lot of interesting work, but it also enacts a kind of erasure for the next gene- ration, which is something I articulate in my essay in the book. What happens when these histories become so intermingled, just because they look similar on the surface, that the individual stakes and questions that they proposed are muted? I’m fascinated by these kinds of misreadings and I think they can be productive, and also a little upsetting. It’s great that artists / photographers–whatever you’d like to call them–don’t have to walk around with such a big chip on their shoulder anymore, but I also think it’s important to under- stand the lineages of the medium you choose to work with. As for the ubiquity of photographic images on social media and the web, I’m not really bothered by all of this because it’s always been a part of the medium. Photography has always been in the hands of scientists, explorers, politicians, the media, and especially amateur enthusiasts. In fact, I would argue that it’s precisely the multiplicity and varied uses of photography that make it so compelling. I’m addicted to Instagram, but I’d never mistake it for my studio work. Hoegsberg: Although the publication is now five years old, many of the ideas feel current. At the same time, the years since have been so characterised by economic down­ turn and political unrest internationally that it seems like more should have changed. What would you add, given the task of writing a postscript or a revised edition today? Klein: Because our project spanned 2007–08, the economic and political climate was very present for us. There was a sense of urgency that resulted from the US housing collapse, the presidential race and the Global Financial Crisis of 2008. Although I think these issues manifest themselves most clearly in the debates around abstraction, if I had it to do over again I’d try and open the discussion up to even more participants and connect it with a more global conversation. The book was structured in such a way as to encourage respondents to pull out different threads of inquiry and I think it would be inter- esting to see how people would take on some of the same questions from our current perspective. I’m sure the answers would be totally different. That said, if I have one big regret it’s that the artist Allan Sekula’s involvement in the project isn’t particularly present in the final publication. Originally we met with Sekula and his students from CalArts to discuss facilitating a series of conversations with international artists, but our process was so fast-paced and our resources were so limited that it never materialised. Instead, I invited him and the artist Walid Raad to participate in a conversation that pointed to all kinds of questions about documentary, narrative, war and education. This was a key part of the project and it pains me that we couldn’t include it in the end, especially in light of Sekula’s recent passing. Hoegsberg: It struck me when I screened Sekula’s film The Forgotten Space (2010) at the Art Academy in Oslo last autumn, how much his films refer to still photo­graphy, and how he uses this to generate a rhythmic narrative that allows his films to enter the discourse of global labour and economics. There’s a richness to how he contributes to the dynamic field between the still and the moving image. I was really fascinated by his work Fish Story (1989–95), which I’ve seen at Tate Britain. It really utilises the temporality inherent in the slide projec­tion, where the timing allows you to settle into each image, and to make connections between the stories. The work was accompanied by an eloquent wall text epilogue (for Mike Davis). To me, it was important that it was Sekula’s own words that framed the work and not the museum’s. In the collection exhibition at Tate Modern, his work Waiting for Tear Gas (white globe to black) was installed, again with his own text, advocating an on ­the­ ground, ‘no mask’, anti­journalistic approach. It was so poignant that you almost didn’t need the pictures. It really resonated with your project and the decision not to include images, to allow the discourse to emerge more clearly. Klein: Absolutely. Captioning and contextualisation are always a big question within photography. Language always contaminates your interpretation of an image and vice versa. In the book, we were wary of images distracting us from the discussions at hand. There are multiple ‘photographies’. Hoegsberg: I do, however, question the impact of Sekula’s more recent series of documentary photographs of workers, which somehow have never really resonated with me in the same way. I could extend this to a general disenchantment with representational work, but I think particularly when dealing with the issue of labour and the economic structures that underpin it, abstraction or per­formativity seem to generate a more productive field of interpretation. Klein: One thing I often think about is how complicated it is for an artist who makes a significant contribution to art critical discourse, it puts an enormous amount of pressure on their own work. There is often an unfair expectation that the artwork is there to fulfill the promise of the writing. In any case, I’m right there with you when it comes to the representation of the body of the worker - not necessarily in Sekula specifically, but in contemporary art in general - as a kind of stand-in for leftist politics. We’re all still in shock that Allan is gone, so it’s hard to process it. As you say, I don’t think there’s any denying his importance as a critic, pedagogue, or his prescient bodies of work that traced the flow of global capital and information, such as Fish Story and Dear Bill Gates, or even the formal qualities of a 1970s installation like Aerospace Folktales. Which is all to say that the abstraction of finance doesn’t always have to be nonrepresentational. I’m cer- tainly not advocating a purely documentary mode, but in some instances I think that the proliferation of formal abstract photography that we saw a few years ago was as much a result of imaging the collapse, as it was a blatant capitalisation that was at times both critical of and complicit with the market. At its most extreme it risked a certain cynicism about the state of photography as a medium. Hoegsberg: Returning to your earlier comment, I think you’re pointing to an important gap between theory and practice, between intention and output, something we all have to be constantly mindful of. As for the candid images in Waiting for Tear Gas, I found the images from the middle of the protest somehow less important than the text that Sekula generated. However, I also understand that this may well be because I’m reading these images through the lens of the last couple of years’ protests and actions around the world, and how they’ve been documented. Smart­phone cameras and ubiquitous internet access have changed the stake for the kind of photography that Sekula advocates in his 1999–2000 project. Works that operate through either representation or abstraction but also through performativity – an awareness of the problems of representation – sometimes seem to be able to sidestep part of this issue. It’s a difficult issue to speak very precisely about, but I wonder if you could expand on these ideas? Klein: Maybe it’s a third type of abstraction that resides in, or performs, the multiplicity inherent in contemporary image production. Perhaps we could refer to an artist such as Mark Leckey in this respect. But of course, Leckey isn’t a ‘photographer’. But then again I’m not convinced that we can define ‘photography’ so simply. Ten years ago, we understood ‘photography’ to be the product of a camera loaded with film that was printed in a darkroom, and increasingly we under- stand it to be the product of a camera with a digital chip that’s manipulated via a screen. When photography was invented, however, it was referred to as ‘sun-drawn images’: there was the direct imprint of the world or the object on a chemical- coated piece of paper. What I’m getting at is that these are all very different things and yet they’re all called ‘photography’. In photography’s rather short life (175 years or so), it’s gone through so many technological, economic and conceptual changes that I don’t think we can come to a consensus about what we all mean when we say ‘photography’. Personally I’m much more interested in an idea of photography than trying to defend or demarcate a particular territory for a medium that’s physically in constant flux. Perhaps these hybridised practices that we’re discussing are closer to what a contemporary under- standing of the photographic medium is. This is something I’m thinking a lot about now, because I’m working on a survey of the artist Barbara Kasten’s work. I was just listening to an interview she gave in 1982, where she voices her frustration at being categorised as a photographer when the sculptural part of her work is equally as important. 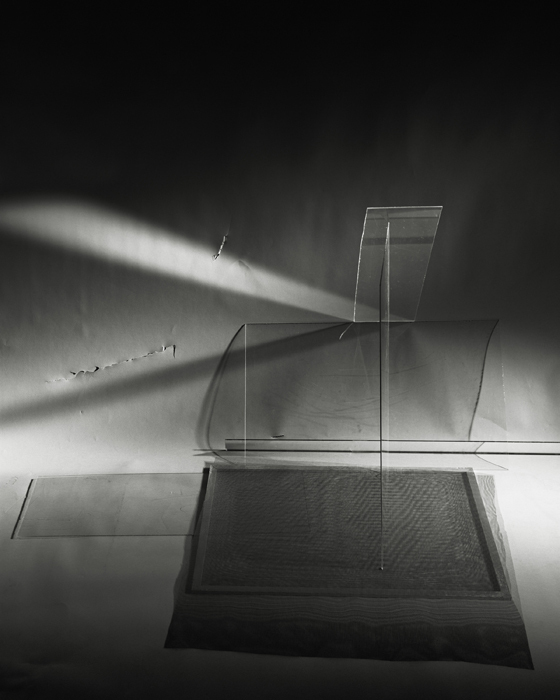 Hoegsberg: I only recently learned of Kasten’s ama­zing work, but I’m enthused by her dynamic compositions that have a performative quality and the complex meeting of sculpture and photography in her work. Tell me more about how you came to her work, and the exhibition you’re working on. Klein: It’s actually related to Words Without Pictures in a way. 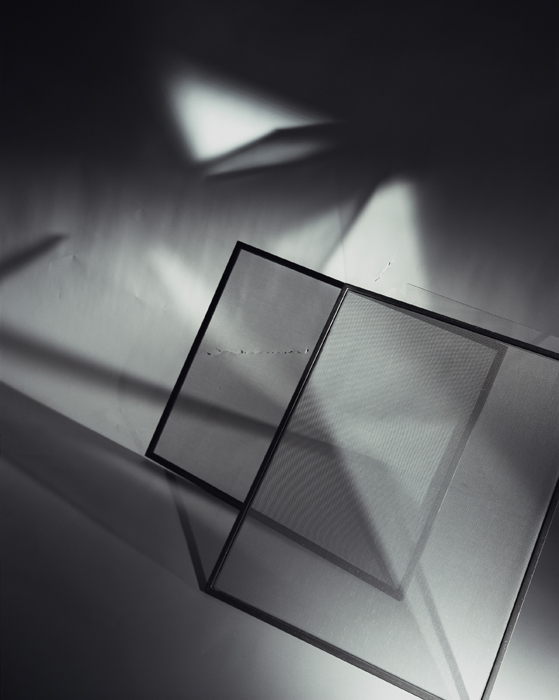 I’d first encountered Kasten’s work in my photography education – she often comes up when you begin learning about colour and lighting – I was reminded of her work around 2007 with the resurgence of photographic abstraction. Some of the work being produced by younger artists around that time was similar to Kasten’s in terms of the questions she was raising about process and photographic representation, but she wasn’t being widely acknowledged. I felt her work was ahead of the curve in terms of straddling different media in tandem with her particular conceptual and formal ways of working. So basically, the more I got to know her, the more her story became increasingly complex and compelling. Her formation develops out of an unexpected intersection of Bauhaus arts pedagogy in the US, California Light + Space, and postmodern concepts relating to representation and architecture. She was older than the ‘Pictures Generation’ artists, so she ended up showing in a post-minimal context and then she got categorised as a ‘photographer’. I don’t think the market or institutions were able to accommodate her kind of hybridised practice at the time. Now I have an incredible opportunity to work with her directly here at the ICA [Institute of Contemporary Art at the University of Pennsylvania] to present a survey of her work for the first time and highlight the strong resonance of her work for a younger generation of contemporary artists. Although Kasten is primarily know for her Constructs of the 1980s – Polaroids and Cibachromes that depict brightly coloured sculptural installations staged for the camera and produced through elaborate lighting techniques – there’s so much rich work produced before and after. For example, she was operating in an ambitious directorial mode in the mid- 1980s with her Architectural Sites photographs, where she worked with a cinematic lighting crew to illuminate and photograph the latest postmodern buildings and sites of globalised capital and culture, whether museums or the World Financial Center. The exhibition will also feature some of her early fibre sculptures and luscious cyanotypes, as well as presenting her collaboration with dancers, her sculptural video work, and the new minimally abrasive photographs that she’s been making for the last seven years or so. Which is to just say that it’s important not only to show the multiple connections in her work through various media, but also to contextualise her as a contemporary figure. Here’s a woman in her late seventies with an incredible body of work behind her, but she’s still very active and the new work is really good. Hoegsberg: There’s something very rewarding about an artist’s older work striking a chord in the present, and also to see someone who represents a practice that spans decades, in a time when commercial structures are obsessed with discovering new young talent. It sometimes seems as if we think that artists under thirty­five have a monopoly on the contemporary. Klein: Contemporary art is so often hinged to a sense of the ‘new’, or at least the ‘right now’, which I think is partially a result of its attachment to the market. Some artwork needs time to come into its own and take on new resonances; perhaps it was ahead of the curve or so in sync with its moment that you couldn’t see it when it was made. In the case of Kasten, she’s still producing compelling and relevant work, which is made even more interesting by the decades of work that preceded it. Hoegsberg: In Venice last year, I was struck by how much work seemed to be engaging the digital and how many video works had a very crisp sculptural composi­ tional language, referring to the photographic (Duncan Campbell, Camille Henrot etc). I find myself wanting to know more about sculpture and film that refers to photo­ graphy (Tamara Hendersen), or photography that positions itself as sculpture (Elad Lassry, and Corin Swoon in the Scottish Pavillion 2013) or in relation to performance (Corin Hewitt). Klein: I’m hesitant to talk about stylistic trends, but I do think that there’s an ever-increasing interest in the multifaceted nature of image production and dissemination, which might have more to do with the impact of the web than with conventional photography. But then again, as I mentioned earlier, I’m not sure that all of these categories are so distinct right now. One thing all of the artists you mention have in common is that they enact a kind of multivalence of photographic meaning and question the agency of a kind of imaged authorship in different ways, whether through voiceovers, archives, found images or commercial practices. Hoegsberg: As Getty has just made 10,000 images from its collection available online, to be shared, altered and disseminated, I’m curious whether you feel online platforms are productive for the discourse of photography today? Klein: If there’s one thing I learned from Words Without Pictures, it’s that the web has its own distinctive temporality and discursive properties. Sometimes it helps to try and slow it down a bit, and sometimes you should just embrace its crazy associative potential. But I’m also a firm believer in print publications and in-person conversations. The web is just one tool for production and distribution. I think we’d be remiss to think otherwise. Hoegsberg: One last question: you’re currently in­ volved in the Hillman Photography Initiative, a special project within the photography department of Carnegie Museum of Art. Can you tell me a bit more about this? Klein: Although the Hillman Photography Initiative is in its nascent stages, so far it’s been really exciting. Right now it’s basically operating as a think tank that will bring together a rotating group of artists, curators, critics and scientists to develop a multifaceted project. We’ve been given a lot of free- dom to dream together and I’m excited about the direction it’s taking. Alex Klein is an artist and a curator at the ICA in Philadelphia where her survey exhibition of artist Barbara Kasten will open in February 2015. This conversation is from Objektiv #8. 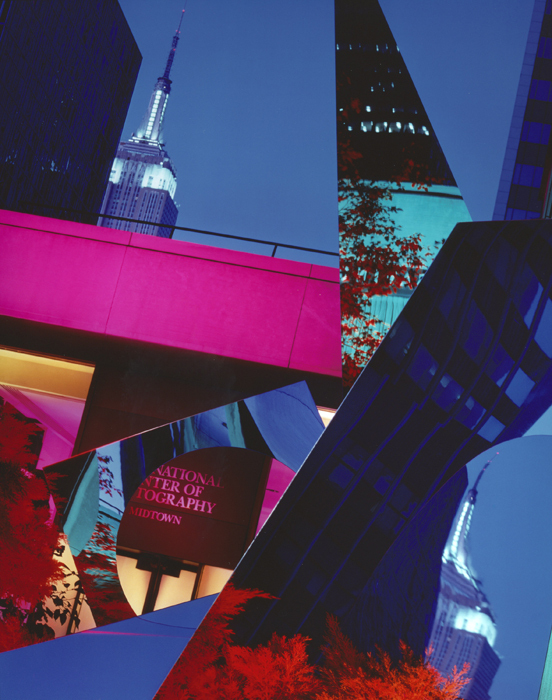 Images below are from the series Scene and the series Architectural Sites, Barbara Kasten.